Telephone Systems Efficiency Co. Inc. 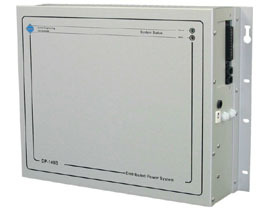 The DP140 is a bulk powering system that provides the necessary 48 volt DC current to power 24 NT1's and 48 multipoint ISDN phones. Integrated battery backup provides the user up to 8 hours of uninterruptible power to insure continuous phone service in the event of local power outages. Output distribution is provided by an application specific distribution module on the side of the unit (50-pin amphenol and 6-pin modular connectors are standard) which incorporates overcurrent protection via thermal fusing. During normal operation the telecommunication grade rectifier/charger provides power to the load while maintaining the batteries in a fully charged state. During extended periods of utility outage the batteries are protected from over-discharge by the built-in low voltage detector and disconnect circuit. Remote monitoring is provided by a contact closure that can be interfaced to a remote alarm unit. The DP140 is also available in a lower cost configuration (designated as the DP140A) which does not have a low voltage disconnect feature. All DP series units are mountable either on a wall or on 19" racks. Mounting brackets for 23" or 25" racks may be ordered as options (specify 23RM or 25RM after the model number). Optimum battery life will be achieved if the unit is operated at a temperature of 25 deg C.
*** The brand names and products within this website are trademarks of their respective companies. �2005 TSE. All rights reserved.